Ever thought you looked particularly unstylish when holding up your smartphone in front of your face to take a selfie? Didn't think so. Regardless, it appears Sony will imminently announce a new selfie camera styled to look like a perfume bottle, giving you the confidence to take a photo of yourself in style. 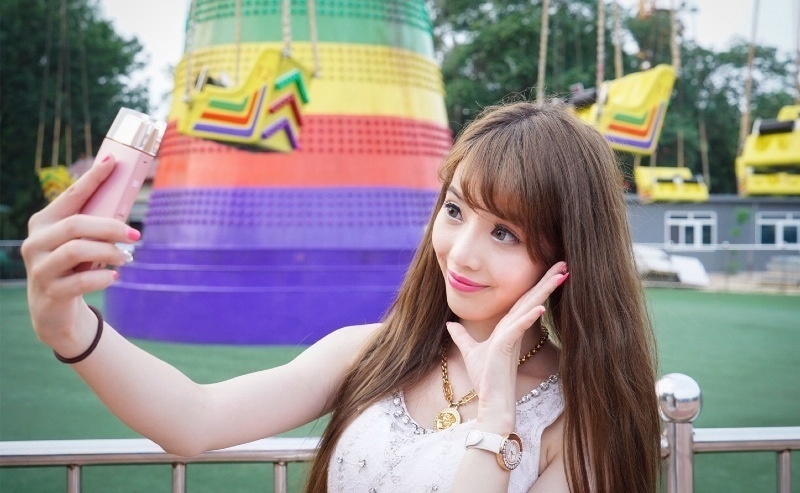 This new selfie camera is destined for Asian markets, where girls in particular are obsessed with taking them on a regular basis. Sony appears to have given out a few models to "Chinese female influencers and models" ahead of an official launch in China on August 22nd. The top of the selfie camera features a large camera lens inside a gold-tinted transparent brick, giving the device its perfume bottle look. This top portion can rotate around, giving you the flexibility to take selfies or standard camera shots as you please. The actual specs of the camera haven't been officially revealed, however Digicame Info might have leaked everything earlier this week. In discussing the Cyber-shot DSC-KW1 (possibly the name of this camera), the site mentioned a 1/2.3-inch Exmor RS sensor with a resolution of 19-megapixels, putting its size around that of a high-end smartphone camera. The Sony-made sensor will be paired with a 23mm-equivalent f/2.0 wide-angle prime lens, while other specs include Wi-Fi, NFC and the ability to run apps. This might mean the camera will run Android similar to Samsung's Galaxy Camera line, facilitating quick uploads to Instagram, Facebook and other social networks. The idea of a perfume bottle shaped selfie camera seems pretty unusual, but hey, it might succeed in Asia.